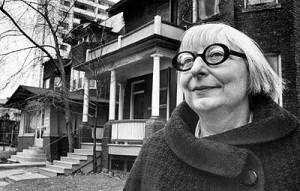 The weekend of May 7-8 marks the celebration of one of the most influential writers and urban activists in North America – Jane Jacobs. (Had she lived, Jane would have been 91 May 4). You may know her by her book "The Death and Life of Great American Cities" which marks its 50th anniversary this year. The New York Times Book Review calls it "Perhaps the most influential single work in the history of town planning...a work of literature." 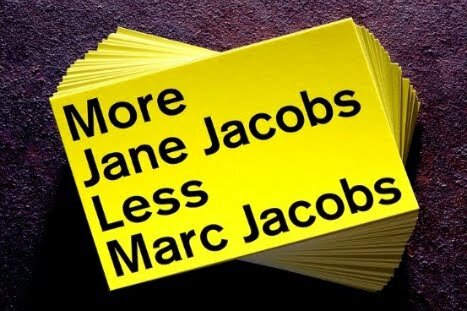 If you've ever used the phrase "eyes on the street" to refer to how streets become safer as more people congregate on them, that was from Jane. She lived in Greenwich Village in New York during the Robert Moses years– that is the years when proposed super-highways were threatening to destroy vibrant urban villages like the neighbourhood Jane lived in. With fights like the one to save Greenwich Village and the demolition of Penn Station (this one didn't work out so well) Jane became the go-to-person for all things urban planning related. Moving from New York to Toronto in the late 60s, she brought her strong civic engagement to lucky Canadians. And it was in Toronto where the idea of the Jane's Walk originated. I love the idea that ANYONE can start a walk ANYWHERE in the world! The idea is that who knows your street/neighbourhood/city better than you? 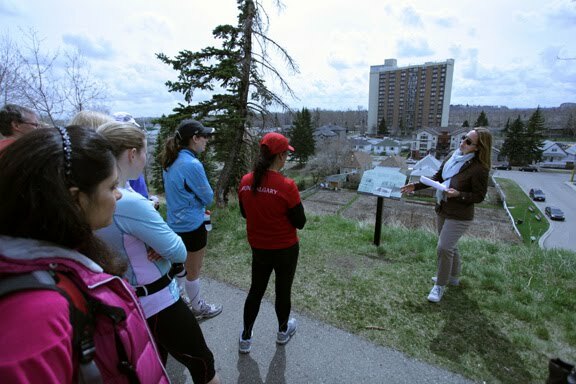 And what better way to celebrate your urban surroundings and civic engagement than to get out for a nice spring walk? (or if you're so inclined, jog - more about this later). Jane's Walks have spread throughout the world and are now on almost every continent (someone, get on Africa!). This is big. You can even get a Jane's Walk iPhone app now. Perhaps we've taken all these ideas for granted 50 years later, but this weekend is a chance to get out and see how Calgary measures up! Here is a listing of all the Jane's Walks happening in Calgary. If you are particularly curious about what's going on in the inner-city neighbourhood of Bridgeland, you can follow me on a quick 10 minute chat starting at the Community Centre at 12:10 this Saturday, May 7. This is one part of the larger Jane's Jog (sorry, this happy urbanist does not jog, she strolls) organized by Noel Keough (Sustainable Calgary +University of Calgary) and Garrath Douglas (The Running Room). The jog starts at the Eau Claire mall's north plaza at 11:00 am that day and runs through Eau Claire, Kensington, McHugh Bluff, Bridgeland (where you can find me), Inglewood and the new East Village. Make sure you check out all the listings in Calgary because they're happening all weekend. Whether exploring the city's edge in Tuscany, or ambling through historic Chinatown, keep this in the back of your mind –"what would Jane think?"